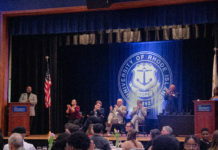 The University of Rhode Island Student Senate unanimously approved their last finance request of the 2014-2015 term by granting additional funding for the Native American Student Organization’s Cultural festival last night. N.A.S.O. Â is a Student Senate-funded and recognized group that aims to spread awareness about the Native American culture through the celebration of life. In an effort to educate URI on Native American culture the group is hosting a powwow, Â a Native American cultural festival, on Saturday, April 26. The powwow will feature dances and welcome Native American tribe leaders to expose URI to their customs. N.A.S.O. President Keith Freeman reported the event’s Â total cost to be over $13,000. However, the group has already raised over $7,000 for the event. N.A.S.O. asked Student Senate representatives to provide the additional $6,000 needed to host the event. The $6,000 Student Senate granted N.A.S.O. will cover the hiring of a master of ceremonies, a director and the head dancers. It will also pay for the tent, the outdoor sound and provide restrooms. The organization’s last powwow had over 1,000 people in attendance and previously Student Senate found the event to be beneficial to the URI student body. Student Senate also approved an amendment to the organization’s bylaws in regard to stipends. The Student Senate aimed to clarify the expectations of stipend position in all URI student organizations. Their Stipend Review Committee and the Bylaws Committee of 2014-2015 have worked on formulating amendments to the Student Senate bylaws all term. The current bylaws establish that organizations must choose between two forms of payment either monthly or semesterly for the stipend positions they offer. All payment amounts must also be determined with the Finance Committee during their annual budget process and may not be changed without their consent. Each group must include the requirements of their stipend positions, violations of said requirements can then result in the removal of any stipend. The now amended bylaws additionally establish that, as reported by the Bylaws Committee, “Any established position which was elected in accordance with Student Senate standards, within a student organization recognized by Student Senate as a Funded Organization non-affiliate, that provides a free or unique service not currently provided by the University and is eligible to receive a budget may be eligible to receive a stipend.” However those interested in receiving the stipends must express their need for them and fulfill the required Student Senate regulations. The amendment will apply to the 2016-2017 time period, and will not affect the currently running stipends. President Amanda Rode was excited to finally get it approved, “You are all making meaningful changes. Now we have to work towards communicating this to other student organizations, and make adjustments to our stipend positions,” she said. President Amanda Rode encourages students to voice their opinions during the Student Summit event next Wednesday, as it will help build the academic goals for the next five years.